Prepared by Brendan P. Coleman, MD, Department of Radiology, Saint Vincent's Medical Center, Bridgeport, CT.
A 62-year-old man with a history of coronary artery disease (CAD) and coronary artery bypass graft (CABG) surgery presented to the emergency department with anterior chest pain and shortness of breath. A computed tomographic (CT) scan of the chest was obtained. 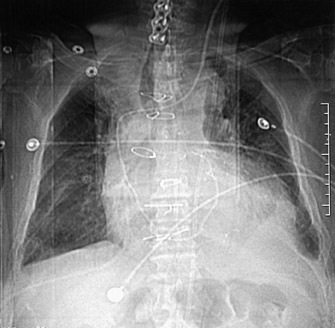 Routine frontal chest radiographs commonly show abnormal alignment to the sternotomy wires in patients with sternal dehiscence that is also visable on the frontal scout CT film obtained while the patient was undergoing CT imaging (Figure 1). 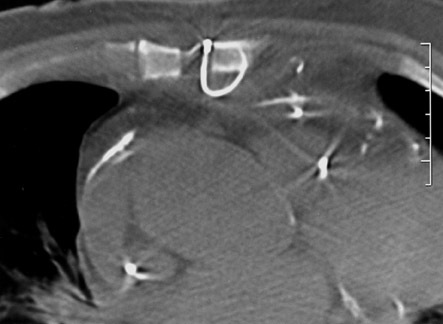 The exact location of the sternotomy wires as well as improved soft-tissue resolution were noted on the axial CT images (Figure 2). The axial images also provide detail regarding possible bone destruction, abcess formation, or subcutaneous emphysema. 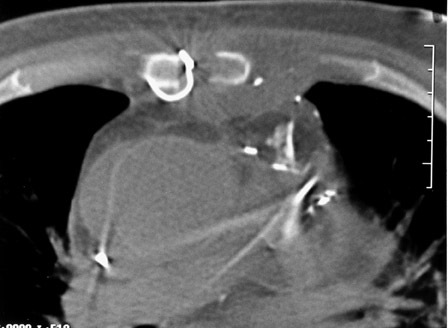 Sternal dehiscence is an uncommon complication of median sternotomy occurring in approximately 3% to 5% of patients. 1 It is potentially fatal and can be a difficult diagnosis clinically. Risk factors include prolonged ventilator support, blood loss requiring transfusion, postoperative wound infection, obesity, age, chronic obstructive pulmonary disease (COPD), and female gender. 2 This complication usually occurs during the initial hospital stay. The diagnosis is made radiographically in most cases. Plain X-ray of the sternum will most commonly reveal sternal wire abnormalities. Displacement of one or more wires is the most common finding. Other findings may be broken or rotated wire sutures. 3 CT may be valuable in detecting the extent of any associated wound infection. Treatment of sternal dehiscence is generally debridement and rewiring. Sternal dehiscence is an uncommon complication that is most commonly diagnosed radiographically. The most common finding is displacement of a sternotomy wire. Radiological Case of the Month: Sternal dehiscence. Appl Radiol.